Stanford researchers have developed the first lithium-ion battery that shuts down before overheating, then restarts immediately when the temperature cools. The new technology could prevent the kind of fires that have prompted recalls and bans on a wide range of battery-powered devices, from recliners and computers to navigation systems and hoverboards. "People have tried different strategies to solve the problem of accidental fires in lithium-ion batteries," said Zhenan Bao, a professor of chemical engineering at Stanford. "We've designed the first battery that can be shut down and revived over repeated heating and cooling cycles without compromising performance." Bao and her colleagues describe the new battery in a study published in the Jan. 11 issue of the new journal Nature Energy. A typical lithium-ion battery consists of two electrodes and a liquid or gel electrolyte that carries charged particles between them. Puncturing, shorting or overcharging the battery generates heat. If the temperature reaches about 300 degrees Fahrenheit (150 degrees Celsius), the electrolyte could catch fire and trigger an explosion. Several techniques have been used to prevent battery fires, such as adding flame retardants to the electrolyte. In 2014, Stanford engineer Yi Cui created a "smart" battery that provides ample warning before it gets too hot. "Unfortunately, these techniques are irreversible, so the battery is no longer functional after it overheats," said study co-author Cui, an associate professor of materials science and engineering and of photon science. "Clearly, in spite of the many efforts made thus far, battery safety remains an important concern and requires a new approach." To address the problem Cui, Bao and postdoctoral scholar Zheng Chen turned to nanotechnology. Bao recently invented a wearable sensor to monitor human body temperature. The sensor is made of a plastic material embedded with tiny particles of nickel with nanoscale spikes protruding from their surface. 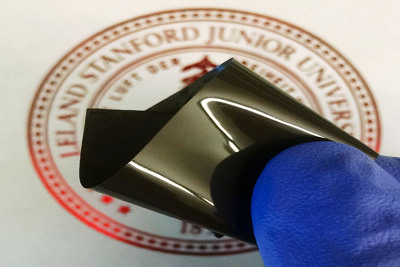 For the battery experiment, the researchers coated the spiky nickel particles with graphene, an atom-thick layer of carbon, and embedded the particles in a thin film of elastic polyethylene. "We attached the polyethylene film to one of the battery electrodes so that an electric current could flow through it," said Chen, lead author of the study. "To conduct electricity, the spiky particles have to physically touch one another. But during thermal expansion, polyethylene stretches. That causes the particles to spread apart, making the film nonconductive so that electricity can no longer flow through the battery." When the researchers heated the battery above 160 F (70 C), the polyethylene film quickly expanded like a balloon, causing the spiky particles to separate and the battery to shut down. But when the temperature dropped back down to 160 F (70 C), the polyethylene shrunk, the particles came back into contact, and the battery started generating electricity again. "We can even tune the temperature higher or lower depending on how many particles we put in or what type of polymer materials we choose," said Bao, who is also a professor, by courtesy, of chemistry and of materials science and engineering. "For example, we might want the battery to shut down at 50 C or 100 C."
To test the stability of new material, the researchers repeatedly applied heat to the battery with a hot-air gun. Each time, the battery shut down when it got too hot and quickly resumed operating when the temperature cooled. "Compared with previous approaches, our design provides a reliable, fast, reversible strategy that can achieve both high battery performance and improved safety," Cui said. "This strategy holds great promise for practical battery applications." Other Stanford co-authors of the study are postdoctoral scholars Nan Liu, Chao Wang, Sean Andrews and Jia Liu; and graduate students Po-Chun Hsu, Jeffrey Lopez, Yuzhang Li and John To. The research was supported by the SLAC National Accelerator Laboratory and the Precourt Institute for Energy at Stanford. The Nature Energy study, "Fast and reversible thermoresponsive polymer switching materials for safer batteries," by Z. Chen et al., can be downloaded at http://www.nature.com/articles/nenergy20159. A video with Professor Zhenan Bao is at https://youtu.be/Mk7DHn_DxUw.